Sapporo has some fascinating places around to do one day trips for sightseeing either by using a car or a public transport. It doesn’t matter if you are a wanderer, a wildlife admirer or a history buff, there are places to suit everyone’s penchant. One such day trip from Sapporo that you can do is to Noboribetsu and Shiraoi Ainu town which is about 120 kilometres from Sapporo. The town of Noboribetsu is a part of the Shikotsu- Toya National Park. It is one of the most preferred spots for Onsen lovers in Hokkaido. 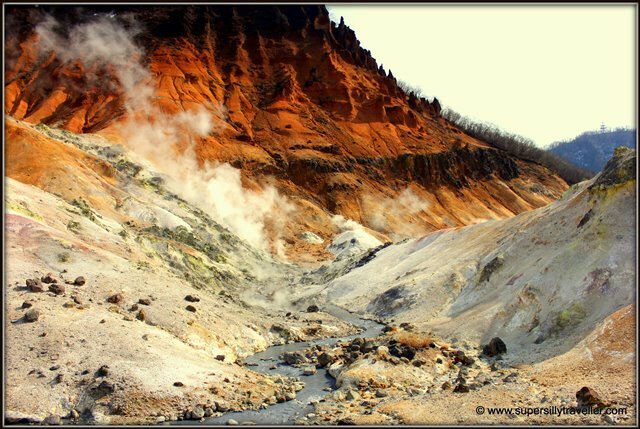 Due to the ongoing volcanic activities around the town, the hot springs in Noboribetsu carry nine varieties of mineral rich water, some of which are even believed to act as a remedy for eczema and bronchitis. This town is also known for one of the most mystical lakes in Japan, Lake Kuttara. Apparently, not a single river flows in or out of the Lake Kuttara. One of my favourite places in Noboribetsu is Jigokudani, also known as the Hell Valley. It`s on the mouth of the volcano Mt. Hiyori, which erupted some 10,000 years ago and produces thousands of liters of hot water per minute. As soon as you arrive at the Hell Valley, you can smell Sulfur. The sight of the hot gas seeping through the earth and bubbling hot water spraying out of the rocks will force you to imagine hell and probably scare you a bit too if you are not sure about where you might end up after this life. This is how the legend of Yukijins, the guardian demons of the hot springs, and Enma the King of Hell came into life. Every year from June to August the people of Noboribetsu celebrate Yukijin Matsuri where men dressed as Yukijins carry fireworks and sparkling columns of fire along the Demon footpath in the valley. The shrine of King Enma in Noboribetsu also has daily performances and judgement is being passed by a mechanical King Enma made in 1990`s. If you enjoy walking and hiking, go on the various scenic trails around the Hell Valley to witness nature’s beauty in the form of hot water marshes, geysers, thermal lakes etc. 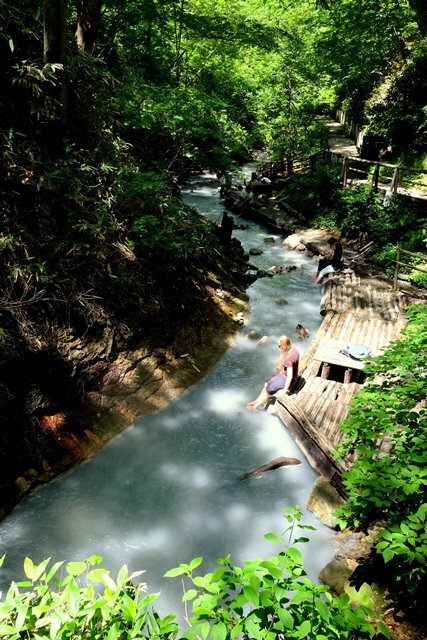 While walking through the Lake Oyunuma scenic trail (a crater lake formed during an explosion of the Kuttara volcano and spouting hot black sulphur water) you can also relax your tired legs at natural foot baths. Close to the Hell valley is Sengen Park. This park contains a natural hot geyser, which erupts every 3 hours for 50 minutes. After the walk, unwind yourself at the onsens in any of the nearby ryokans. Most of the ryokans in Noboribetsu offer day entries costing from 500 JPY – 2000 JPY. A list of ryokans with day charges to use onsen is here. If you are traveling with kids and have some time to spare, visit the Noboribetsu Date Jidaimura, a historic theme park approximately 10 minutes by bus from Noboribetsu Onsen. By car from Sapporo – Takes 1 hour and 30 minutes using the Hokkaido Express way . Toll 3000 JPY. Approximately 3 hours (Toll free) using the route number 453 route and number 276 towards Shiraoi. This is a scenic mountain route passing though the beautiful lake Shikotsu. I highly recommended this route if you have spare time and want to save on toll. By Public transport to JR Noboribetsu station – 1h10min. Catch express Super Hokuto, Hokuto, or Ltd. Exp. Suzuran JR train. Round Trip Fare ( S Ticket) : 4,480 JPY per adult. The Noboribetsu Onsen is approximately 10 minutes by bus (350 JPY) or taxi from the JR Noboribetsu station. Bus – 1 hour 40 minutes. Catch bus from the Donan bus stop No 10 or Chuo bus stop No 16 from Sapporo Bus Terminal. You can also catch a direct bus to the Noboribetsu Onsen from the New Chitose Airport. Ainu are an indigenous group of people living in the Northern Japan, they are also the original inhabitants of Hokkaido. The Ainu history and culture is not well known as they had no written language system. The Ainu verbal language is very different from the modern world Japanese and their history was passed only through word of mouth to generations after generations. 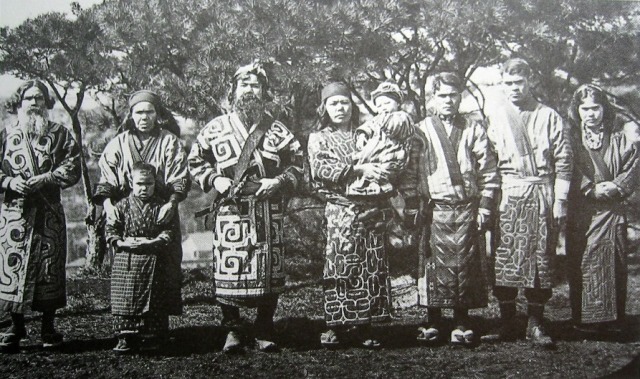 As most of the indigenous groups are, the Ainu are traditionally very close to the nature, and live a simple life. Shiraoi in Ainu means rainbow. The Shiraoi Ainu Museum near Noboribetsu opens a door for the modern world to get a glimpse of the Ainu history and culture. 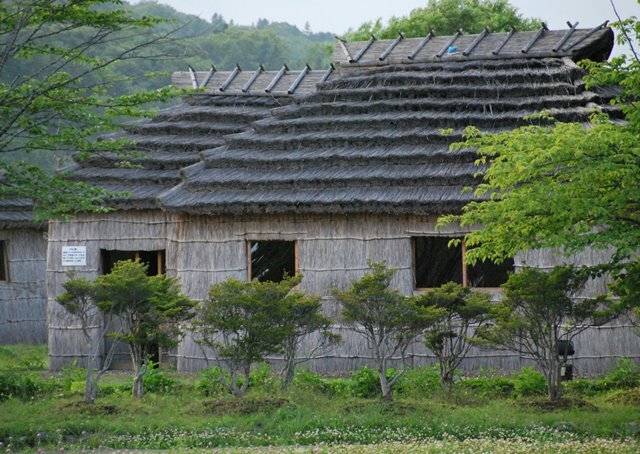 The museum is a replica of a real Ainu village around the Lake Poroto. Hence, the museum is also known as the Poroto Kotan (Village near a Lake) in Ainu. The Shiraoi Ainu Museum is considered to be the best Ainu museum in Japan and visiting this village will give you a sense of how life was during the ancient times in Hokkaido. Here, you can have a close encounter with the Hokkaido brown bears and Hokkaido dogs also known as Ainu dogs. The regular performances of Ainu music and dance will delight you and give a sense of appreciation for the Ainu culture. If interested, you can also interact with the Ainu people and get to know more about their culture. Museum admission fee is 750 JPY for adult. Click here for more information on the Shiraoi Ainu Museum. By Car from Sapporo – 1 hour 15 minute from Sapporo using the Hokkaido Expressway. This route has Toll. Roughly 2 Hours 20 minutes using the toll free Route 453 and then change on to route 276 after Lake Shikotsu. By Car from Noboribetsu – Approximately 50 minutes. Click here for directions. By Train from Sapporo- Around 1 hour by JR Limited Express Suzuran train. Round Trip Fare (S Ticket) 3,490 JPY. Shiraoi Ainu museum is about 15 minutes walk from the JR Shiraoi Station. From JR Noboribetsu Station – 13 minutes by JR special Express Super Hokuto Train to Sapporo or 25 minutes by Local Train to JR Shiraoi station. Visiting Noboribetsu and Shiraoi Ainu museum in any season will be an experience in itself. Spring, summer and autumn is a good time to enjoy the walking trails and the museum . Winter is an awesome time to relax in the mineral rich hot springs at Noboribetsu and to have a go at ice skating and smelt fishing on the frozen Lake Poroto in Shiraoi . Wanted to get your suggestion on my trip. I will be arriving at New Chitose Airport early morning and planning to go directly to Hakodate for 3 nights. After reading your blog, i do find it a possibility to drop by Noboribetsu and maybe the ainu village before heading down soft to Hakodate to end my trip for the 1st day. Are all these accessible and doable at such a short time frame? i wont be driving and will be taking the train, so transportation may be a bit limited to any outskirt areas and location of interest. I just want to say a big THANK YOU for all the work you’ve put into your blog entries! I’m a free & easy solo traveller going to Hokkaido soon and I can’t stress enough how difficult getting information of traveling in Hokkaido can be for solo travellers with Public Transport. Thanks so much for your work! They are interesting to read, have comprehensive information and valuable insights! Thank you for your kind words. I hope you have an awesome trip to Hokkaido. Feel free to get in touch should you need any information. Hi Monika, I enjoy reading your blog! Do you know whether ice skating or smelt fishing would be aavailable mid Dec or it is too early in winter? If you are looking for an outdoor ice skating rink, then mid Dec is early. The same goes for smelt fishing as well unfortunately. Smelt fishing season starts around late December to early January. Thank u for your very informative piece on noboribetsu. I’m thinking of visiting Hell Valley in my next trip……Is doing a day trip to noboribetsu in mid November a worth it activity? Visiting Noboribetsu any time during the year is fun. You will probably miss out on the autumn leaves around Hell valley in mid November, but a day trip is still a good activity. Do you plan to go to onsen as well? Hi Monika. I just discovered your blogs and I’m so glad I did! Your blogs have been really helpful in planning our brief stay in Hokkaido before we head to Tokyo. My husband and I will be traveling to Hokkaido in late March next year, so it was really timely to find all this great information you’ve posted on Sapporo and surrounding areas. Question on ryokan reservations… I am particularly interested in staying at Noboribetsu Onsenkyo Takinoya, but all hotel booking sites indicate sold out status for all of March and April. I realize it’s high traveling season, but do you know if that is likely true or if they just haven’t opened up their rooms for reservation yet? I heard ryokans typically open up reservations with a 3 to 6 month advance window. Any insight you can provide would be much appreciated!! Thank you for your comment and encouraging words. I suppose it is a bit too early for the rooms to be all sold out for March and April 2019. Perhaps, you can give them a call and check. Since lot of overseas tourists visit Noboribetsu, the Ryokan might have an English speaker to help you. Let me know on how you go.